Back to back rounds of 67 has Jake Higginbottom at 10-under-par and one stroke ahead of Daniel McGraw at the Keperra Bowl in Brisbane. With a victory last week at the Queensland Amateur Championship where he defeated Tim Hart, 2&1, Higginbottom continues to go from strength to strength following a recent move to the Gary Barter camp at The Australian Golf Club in Sydney. Higginbottom credits his new coach for his recent fine run of form that has Higginbottom with four top-5 finishes including the Lake Macquarie Amateur and runner-up finishes at the Australian Junior Championship and the Harvey Norman Junior. “I’ve done an awful lot with Gary Barter at The Australian Golf Club in preparation for these events and with moving forward,” says the 17-year-old. Opening round leader, Steven Slappendel, slipped back to be in a tie for 15th place after a disappointing second round 6-over par 78. Corey Crawford is three strokes back from Higginbottom in outright third at 7-under after he managed a 4-under par, 68. Rory Bourke, who at the recent Golf SA Amateur Classic finished in 3rd position behind Daniel Bringolf and tournament winner Brett Drewitt, moved up the leaderboard with his second round 4-under-par, 68, and is in a tie for 4th position along with Michael Smyth, Daniel Bringolf and Marika Batibasaga. The cut of top-70 and ties came in at 5-over par. One of the tournament favourites current Australian Stroke and Boy’s Champion, Cameron Smith, opened with disappointing rounds of 74-75 to finish on the cut number. Australia’s former number one world ranked amateur, Ryan McCarthy, has shown his recent layoff from the game after injuring his shoulder in the surf has done no harm to his chances of a solid performance in this tournament. The Tasmanian was well inside the top-70 with rounds of 73-69, to be at 2-under-par and be in a tie for 15th, eight strokes behind Higginbottom. 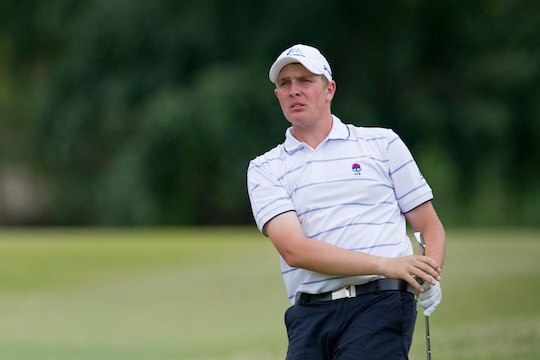 With pending commitments back in the UK and US awaiting McCarthy, the quarter finalist at last year’s US Amateur is eager to improve on his current world ranking of 26 after peaking inside the world’s top-15 following his runner-up finish at the NEC Master of the Amateurs at Royal Melbourne in January.